I'm sure the T COULD add a park on top but it would require massive drainage reconstruction which would cost big$. The stations already were built on the cheap. ^^ About the old Hynes entrance and redevelopment, it would almost certainly need to be done in concert with the highway air rights, because otherwise it's limited to a ~15 ksf triangular lot with about 20 feet of frontage on Boylston Street and a wall bordering the highway that wouldn't have any windows in anticipation of a development over it. Joe Pesaturo, spokesman for the T, who noted that the authority had problems getting some of the necessary permits from the city ? Maybe the MBTA and their contractors knew they needed permits, but their plans weren't up to snuff? I christen thee "brotosaurus ribs"
Question about the construction in Kenmore: is it supposed to make the square more pedestrian-friendly (I remember Menino advocating something along those lines) or is this merely the erection of a showy bus shelter? More trees than before, but the whole thing is mostly an upgrade to what used to exist. Less industrial, more modern. Uh oh...they're not really planning to brick all the sidewalks, are they? 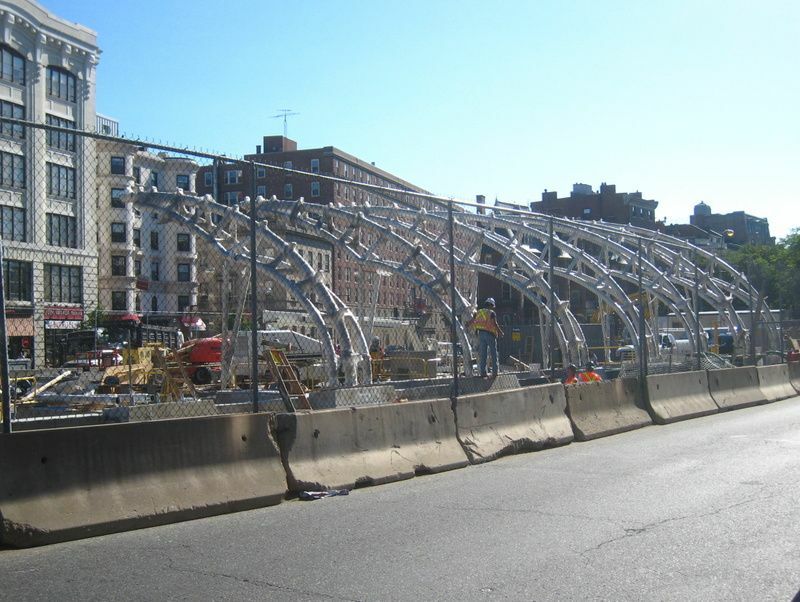 Who's looking forward to standing in that "shelter" (optimized to catch the North wind off the Charles) in January? It would look nice in Miami, Dallas, or Atlanta. In Boston, worthless! Prediction: drunken Sox fan, noting the striking resemblance that wind tunnel structure has to monkey bars, will climb up the trusses to cheers of other drunken Sox fans, fall down, and be promptly squished by lead-footed MBTA bus extraordinaire. Menino will pass a stone, and the T will trim the structure in concertina wire, the look of which over time will be softened over time by wind-blown Dunkin Donuts detritus. After about 3 months the trusses and the glass will be so dirty nobody will want to touch them. After 6 months of pigeons shitting on people waiting under the structure they will put up those spikes to prevent the birds from landing. Architects sure have some bright ideas. The "ribs" are too thick and clunky looking. These ribs look like cast offs from a modern day roller coaster. The structure doesn't seem to offer much shelter from the sides. I can imagine standing under this thing in the dead of winter with a bone chilling wind going right through me! I would have preferred an elegant Buckminster Fuller type glass dome structure here, incorporating some modern neon suspended from the ceiling. I think that would have been a youthful and cool look for this area and would have looked great at night. I have to say that I just look forward to this project being completed. Progress on this site has been slow that it seemed like only one man was doing all the work! Progress on this site has been slow that it seemed like only one man was doing all the work! It's rather sad that the original tunnel and station (which had more ornate tile work and difficult excavation) took less time than the current 'renovation'.